The aircraft diverted from its original course and made an emergency descent and landing at Goose Bay in Canada on Saturday after the engine malfunction over the Atlantic causing fear in the cabins. Passengers reported on social media that they heard a thudding type of noise as they experienced vibrations rattling throughout the cabin as the A380 began to descend and head to the nearest airport, big enough to handle the superjumbo. "We heard a big popping sound and the aeroplane basically dropped and it was trembling. You could definitely tell something was different and it wasn't just turbulence," said one passenger to American media. Another passenger said he had been stretching with his wife when "suddenly there was an enormous bang, and the whole plane shook." John Birkhead added "We were lucky we weren't tossed to the ground,"
Read more on this story including the full statement from Air France. There was a "tremendous bang". Pamela Adams, another traveller on the Air France flight told reporters, "It was like the plane hit a Jeep at 35,000 feet...We grabbed onto something and then we sat down, and the plane righted itself fairly soon." Some passengers believed at first the aircraft had suffered a bird strike, but it soon became much more serious than that. Shortly after the pilot used the public address system to advise the passengers the aircraft had lost one of its engines and would be landing in Canada. Rick Engebretsen, tweeted about a "loud thud and a lot of vibration" while a fellow passenger also took to twitter to say "one of our engines is slightly blown apart," as well as posting pictures of the stricken engine. 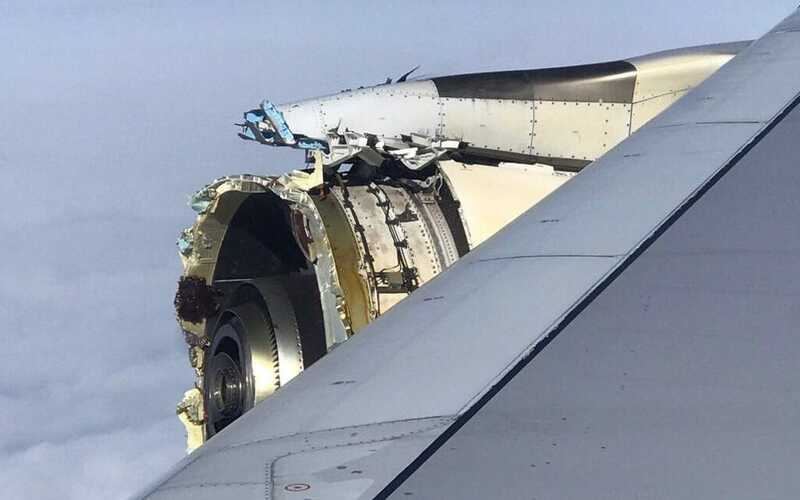 It is hard to tell exactly what happened from the photographs which have been shared on social media, which seem to show that the entire front of the engine cowling or nacelle is missing. There does appear to be some other parts absent, however, the bulk of the engine seems to be intact. The flight, AF066 was carrying 496 passengers and 24 crew at the time of the incident, Air France released the following statement. 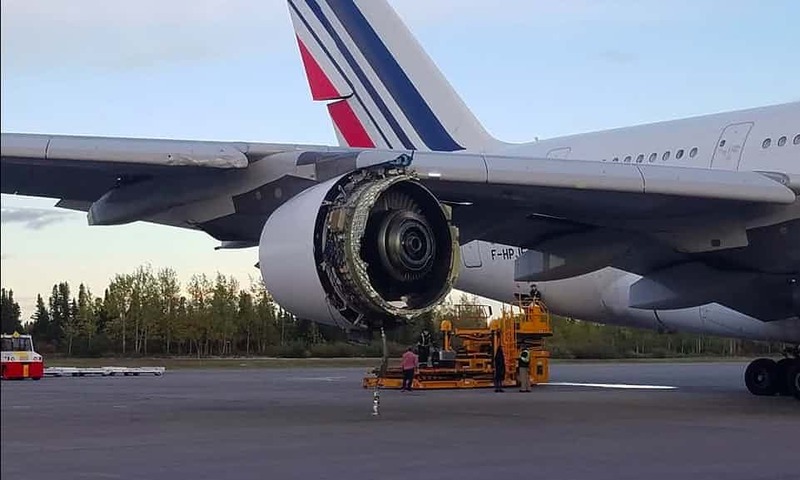 Air France confirms that the crew of flight AF066 operated by A380 from Paris-CDG to Los Angeles decided to divert to Goose Bay airport (Canada) following serious damage to one of its four engines. The aircraft landed safely at 15:42 (GMT), and the regularly trained pilots and cabin crew handled this serious incident perfectly. The passengers are currently being assisted by teams dispatched to the location. A first flight operated by Boeing 737, a specially leased aircraft by Air France, will arrive in Los Angeles at 6.00am local time following a technical stop-over in Winnipeg. A second flight operated by an Air France Boeing 777-300 will join Atlanta where Delta will arrange for passengers to be flown to their final destination, notably Los Angeles by a specially leased flight. Air France apologizes once again to all its customers affected by this incident for which specific commercial measures will be implemented. An investigation is currently underway to shed light on this serious incident notably with representatives from the BEA (French Aviation Accident Investigation Bureau), the aircraft manufacturer Airbus and Air France.